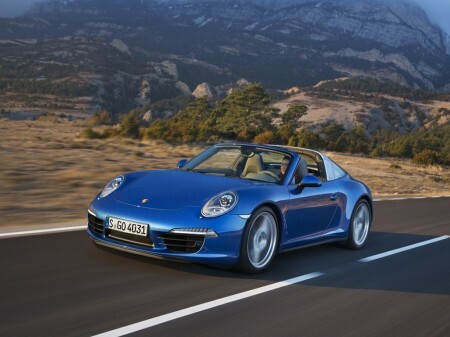 Porsche launched two new models in their lineup, the 911 Targa 4 and Targa 4S, at the 2014 Detroit Auto Show. The roof can be opened at the touch of a button, allowing customers to enjoy the feel of a convertible while offering slightly more protection, thanks to the roof bar. As the ‘4’ indicates in the name, the Targa will only be available in all-wheel drive format. Under the hood is the same engine as their coupe variants, the entry-level 911 Targa 4 having a 340 bhp 3.4L flat-6 motor, while the Targa 4S gets the 400 bhp 3.8L flat-6 unit. When equipped with the optional PDK and Sport Chrono package, the Targa 4 can do 0-60 mph in 4.2 seconds, while the Targa 4S sprints from 0-60 mph in 3.8 seconds.